On this holy day of obligation, the Church celebrates the Immaculate Conception of the Blessed Virgin Mary, an event that heralds God's choice of Mary to be the Mother of the Redeemer. The Immaculate Conception is the doctrine that the Blessed Virgin Mary was preserved from any stain of sin, including original sin, from the moment of her conception in her mother's (St. Anne) womb. 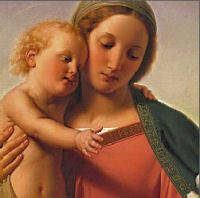 The Virgin Mary, chosen Mother of the Redeemer, is robed in the splendor of her stainless innocence, and clothed with the beauty of one redeemed in Christ and prepared to receive Him in her womb.